James Ernest Ogden, miner, unionist and man of independent spirit, was born at Durdidwarrah, near Geelong, Victoria, on 8 March 1868, son of Robert Ogden, miner and farmer, and Hannah, née Fenby. Educated at Steiglitz State School, James later worked for his father growing grain and raising pigs, and also began training as a primary schoolteacher, though he never practised as a teacher due to the need to help his mother raise the family following the death of his father. After leaving home, the young Ogden roamed through Victoria, New South Wales, South Australia and Queensland, working as a shearer, drover and horse-handler, and ending up on the Western Australian goldfields. He returned to Victoria, his life taking a major change when a mining syndicate sent him to Tasmania. In 1896 he settled on the west coast, where he worked as a miner and prospector until entering the Tasmanian Parliament. Like two other early Tasmanian senators, John Earle and James Long, Ogden earned a reputation as an able member of the Amalgamated Miners’ Association of which he became Tasmanian president. On 10 February 1897 Ogden had married Emma Etta Colls at St Andrew’s Church, Clifton Hill, Melbourne, in accordance with the rites of the Church of England. The marriage produced three daughters and one son. Continuing with his union work, Ogden also found time to serve on the Zeehan and Dundas Hospital Board, perform the duties of a Justice of the Peace, play an important role in the creation of the Zeehan School of Mines, and write for the Hobart newspapers, Clipper and Daily Post. From 1903 he was prominent in the Workers’ Political League, the forerunner of the Australian Labor Party in Tasmania, and in 1906 narrowly won the House of Assembly seat of Zeehan as an acknowledged candidate in the labour interest. To add to his income he continued to work as a miner during parliamentary recesses. In 1909, the year in which he failed to support the Labor pledge, he won the seat of Darwin. Ogden was Treasurer in the Government of Premier-for-a-week John Earle in 1909 and Chief Secretary, Minister for Mines and Minister for Labour in Earle’s second administration from April 1914 to April 1916. The second Earle Government was greeted with dismay by conservatives, but it soon put a human face upon the feared Labor Party, performing in a much less threatening fashion than the doomsayers had expected. For his part, Ogden, who had become president of the Workers’ Political League in 1911 (and again in 1918), was seen as a minister who worked very hard to prevent unemployment on the west coast mining fields. In 1907 he had helped secure the appointment of the Royal Commission on Wages and Wage Earners in Hobart. His firsthand experience in the mines made him acutely conscious of the diseases suffered by miners. He was responsible for securing the passage in the House of Assembly of the Workers’ Compensation Bill 1917, though the bill did not pass the Legislative Council. Ogden had long been in the conservative wing of the Labor Party, opposing the push for a socialisation policy, and denouncing calls for the party to support direct action by trade unions seeking industrial reform. He was apprehensive of growing union power, which he believed taught the worker ‘to regard industry as something which only has interests for the few, that capital and labour must always be at variance, and that there must ever be a class war between the two’. His presidential addresses at the 1918 and 1919 Tasmanian ALP conferences, wherein he denounced direct action as a betrayal of the Labor Party, alienated many of his listeners. He feared communist influence within the union movement, and was not prepared to accept all trade union actions without criticism. He rejected union claims that an increase in the cost of living justified a push for wage increases, though as minister he supported job preference for unionists, despite his later claim (in 1929) that he had always opposed the principle. At various times he also warned of union plans to overthrow the arbitration system. 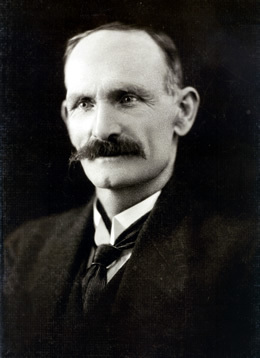 Ogden had unsuccessfully contested the Senate in 1913, but by 1922, enough Labor people were antagonised by his conservative attitudes for the party’s Tasmanian executive to request him to leave state politics by contesting a Senate seat once again. He obliged, was successful—with Nationalist preferences—and retained the seat until his death in office ten years later. Tasmanians since Federation had considered that the federal compact was crippling their state. Ogden was one, along with Herbert Hays—with whom he entered the Senate—who believed that Tasmania deserved special financial treatment by the Commonwealth to rectify ‘the depredations of the larger and more selfish States’. Tied in with this concern was Ogden’s belief that the Senate’s function as a States House must be upheld. He argued that the role would be more effectively performed were the Senate to be non-party in its operations. He regretted the impact of party discipline, which he described as ‘vicious’, and favoured the introduction of proportional representation. He considered that the Senate had never been intended as a party house. Nowhere were these attitudes on federalism and the party system more apparent than in his support of the major legislative proposals designed by the Bruce–Page Government to combat industrial unrest on the waterfront, and introduced into the Parliament in June 1925. Furthermore, he believed that the militant maritime unions were damaging Tasmania, dependent as it was on sea transport. Ogden crossed the floor of the Senate to support all three measures: the Government’s Immigration Bill, a subsidiary measure, the Peace Officers Bill, and the Navigation Bill, all of which aimed to break the power of the Seamen’s Union. Nevertheless, his political roots remained with Labor. ‘I am’, he said, ‘a Labour man, but I claim the right to retain freedom of speech when I think that unionism is going astray’. He averred that he was the only Labor representative sufficiently ‘daring’ to speak out against the Seamen’s Union. Be that as it may, it seemed inevitable that he and the ALP would eventually part company. In July 1925 Ogden moved a motion requesting that the Navigation Act should be amended to permit ‘overseas vessels to carry passengers between the mainland and Tasmania’, a proposal which he assured the Senate had the approval of the Tasmanian Labor Party, and which lapsed at the prorogation of the Parliament on 28 September 1925. By 1927 Ogden was, in effect, an independent senator, though with Labor sympathies. Speaking on the States Grants Bill in March, he said: ‘I owe allegiance to no political party, so that the observations I make are based on honest convictions, and are not forced by party political considerations’. During the election campaign prior to the November 1925 federal poll, he had refused to speak on behalf of any Labor candidates in Tasmania. In February 1926 he was expelled from the Tasmanian Labor Party at a state conference in Launceston, an action that was accepted by the federal Labor Caucus with reluctance. By the time of the 1928 election, Ogden was campaigning as a Nationalist. On his return to the Senate, he became an Honorary Minister, serving from November 1928 to the fall of the Bruce–Page Government at the October 1929 election. From December 1928 he was also Assistant Minister for the newly created Department of Industry. His elevation to the ministry may have been due to the Tasmanian electors punishing the Government at the polls for its failure to include Tasmanian representatives in the previous federal ministry. His attack on Labor during the debate on the 1929 Transport Workers Bill was stinging: ‘The Labour party is building up a psychology which will be a danger to future generations. It is silent when it should speak, and shouts when it should remain silent’. During the Scullin Labor Government’s period of office (1929–32) Ogden, a fierce critic of both the Government and the Labor Party, warned of the dangers that he considered were posed by Labor’s ‘communist masters’. He declared that there was ‘a dangerous element in this country that wants to destroy existing institutions and set up, probably, a regime similar to that which now harasses Russia. I should not refer to that element so seriously but for the fact that it controls the Labour movement’. Overriding all his considerations of union and party discipline was Ogden’s deep opposition to any form of compulsion and his distrust of the party system. Ogden was an angular figure whose thin face was dominated by a large drooping moustache. It was said that his health had been permanently affected by his work in the mines, and in the early 1930s it steadily deteriorated to the extent that he failed to attend the Senate at all in the second half of 1931. Senator Hays visited Ogden shortly before his death, which occurred on 5 February 1932 at his home in Albert Road, Moonah. (In Canberra, Hays conveyed Ogden’s best wishes to his fellow senators, and the sad message that he was not likely to return to the Senate.) Ogden was buried in Cornelian Bay Cemetery, and was survived by his wife and children. His seemingly frail figure had disguised a strength of character and a determination to stand by his principles at whatever political cost. George Pearce’s eulogy in the Senate was unusually frank when he described his former colleague as ‘most outspoken in the expression of his views’, the strength of which ‘sometimes brought him into violent conflict with those who held opinions contrary to his own’. Ogden’s refusal to see unions as the key factors in producing social and industrial change made him a controversial member of the Labor Party. In the end it was this attitude that produced the break with his party, many members of which were less than impressed with his view of himself ‘as a strong advocate for the abolition of Party Governments’. Ogden’s support of the Nationalist–Country Party Government eventually saw him excoriated as a ‘Labor rat’, and, in fact, it has been claimed that many of his actions ‘were never forgiven by Tasmanian unionists’. Another view of this most controversial politician is that Ogden’s cautious, pragmatic, non-ideological approach to government places him firmly in the long-term tradition of the Tasmanian Labor Party. His unwavering support for Tasmania during his years in the Commonwealth Parliament no doubt helped further develop the strong support for the Senate that has been so much in evidence in the island state. Scott Bennett, ‘James Ernest Ogden’, ADB, vol. 11; Information from the Ogden Papers, in possession of the author, is used throughout the entry; Bulletin (Syd. ), 10 Oct. 1918, p. 14; Mercury (Hob. ), 6 Feb. 1932, p. 9; Lloyd Robson, A History of Tasmania, vol. 2, OUP, Melbourne, 1991, p. 219; CPD, 17 Feb. 1932, p. 11. Examiner (Launc. ), 6 Feb. 1932, p. 6; D. J. Murphy (ed. ), Labor in Politics: The State Labor Parties in Australia, 1880-1920, UQP, St Lucia, Qld, 1975, pp. 409, 428; World (Hob. ), 24 Apr. 1919, p. 7; Richard Davis, Eighty Years’ Labor: The ALP in Tasmania, 1903–1983, Sassafras Books and University of Tasmania, Hobart, 1983, pp. 8–9, 117–20. M. D. McRae, ‘The Tasmanian Labour Party and Trade Unions 1903–1923’, THRAPP, Apr. 1956, pp. 4–13; Davis, Eighty Years’ Labor, pp. 14–15; World (Hob. ), 2 May 1919, p. 3, 6 July 1921, p. 6, 7 July 1921, p. 6, 3 Sept. 1921, p. 5; SMH, 26 July 1921, p. 9, 9 Sept. 1921, p. 9; CPD, 27 Nov. 1929, pp. 292–3; SMH, 30 Nov. 1927, p. 15. McCrae, ‘The Tasmanian Labour Party and Trade Unions 1903–1923’, p. 12; CPD, 16 Aug. 1923, pp. 2861–3, 2 Aug. 1923, pp. 2020–2, 5 July 1923, pp. 686–98; SMH, 20 June 1922, p. 9; CPD, 17 Mar. 1927, pp. 558–63. Geoffrey Sawer, Australian Federal Politics and Law 1901–1929, MUP, Carlton, Vic., 1956, pp. 238–9; CPD, 16 July 1925, pp. 1073–7, 2 July 1925, pp. 628–33; Senate, Journals, 27 Aug. 1925. Argus (Melb. ), 6 Feb. 1932, p. 21; CPD, 17 Mar. 1927, p. 558; Patrick Weller and Beverley Lloyd (eds), Federal Executive Minutes 1915–1955, MUP, Carlton, Vic., 1978, p. 91; Patrick Weller (ed. ), Caucus Minutes 1901–1949, vol. 2, MUP, Carlton, Vic., 1975, pp. 11, 257; Examiner (Launc. ), 26 Feb. 1926, p. 5. Weekly Courier (Launc. ), 11 July 1928, p. 3; Sawer, Australian Federal Politics and Law 1901–1929, pp. 304–5; CPD, 13 Mar. 1929, p. 1068. CPD, 27 Nov. 1929, p. 294; Examiner (Launc. ), 6 Feb. 1932, p. 6; CPD, 17 Feb. 1932, pp. 10–12; Murphy, Labor in Politics, pp. 434–5. This biography was first published in The Biographical Dictionary of the Australian Senate, vol. 2, 1929-1962, Melbourne University Press, Carlton, Vic., 2004, pp. 190-193.